Live streams are here, and audio archives of the past two weeks shows are linked below! 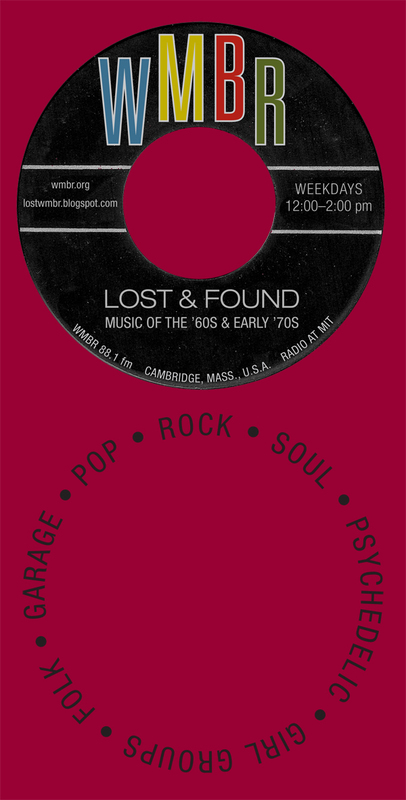 Lost & Found explores music of the 1960's to mid-70's. We cover all genres, and spotlight music you won't hear on commercial "Classic Hits/Classic Rock" stations. Hits that have been forgotten, or the "hits" that never were! Please follow our playlists on "Track-Blaster" and "Like" us on Facebook! Hello, "Lost and Found" listeners! We are no longer posting our playlists regularly on this blog, but most of us are now posting them on WMBR's "Track Blaster" playlist site, now used by most DJ's at WMBR. And, as always, you can email us and find links to audio archives of our last two weeks of shows on the WMBR program schedule section for "Lost and Found" here on this page: http://www.wmbr.org/www/sched-mul#laf. "U" Really Got Me: Artists Whose Names Begin with "U"
My guest d.j. today was Josh Boyce, who once again generously pledged for air time during WMBR's 2013 Fundraiser. Thanks, Josh! "Like" Lost & Found on Facebook! Hear WMBR on your iPhone! Sorry, the link to the "Lost & Found" Concert Report has been removed because I have not had time to keep it updated and current. I hope to be able to bring it back sometime in the near future. Due to federal Digital Millennium Copyright Act regulations, we're sorry that links to audio archives over two weeks old have been removed and cannot be posted. Please feel free to contact us for further information.